TEGUCIGALPA, Honduras (CNN) -- The U.S. State Department is calling on Honduras' de facto president to immediately rescind an emergency decree that limits constitutional rights such as freedoms of expression, travel and public congregation. Robert Micheletti, de facto president of Honduras, says he'll repeal an emergency decree, but not immediately. "The freedoms inherent in the suspended rights are inalienable and cannot be limited or restricted without seriously damaging the democratic aspirations of the Honduran people," said State Department spokesman Ian Kelly in a statement late Monday night. Earlier Monday, Roberto Micheletti announced he would repeal the law, but it would not be immediately. The decree will undergo a legal review, he said. Still, Micheletti's announcement was an about-face. He had announced the policy less than 24 hours earlier in response to unrest that increased significantly after ousted President Jose Manuel Zelaya secretly returned to Honduras on September 20 and took refuge in the Brazilian embassy. The 45-day decree announced Sunday night forbids any unauthorized public gatherings, allows officials to make arrests without a judicial order and lets the government close down news media that threaten "peace and order." Micheletti said he would consult with the supreme court to repeal the decree, after a meeting with the leading presidential candidates. "This decision was made because (Zelaya) was calling for insurrection ... but I'm going to listen to the other powers of the state and we're going to make the most wise decision in the interests of Honduras," Micheletti said, according to the newspaper La Prensa. Monday marked the three-month anniversary of Zelaya's ouster in a military-led coup on June 28. In the wake of Micheletti's decree, Jose Miguel Insulza, secretary general of the OAS, said the Canal 36 TV station and Radio Globo were reported closed. 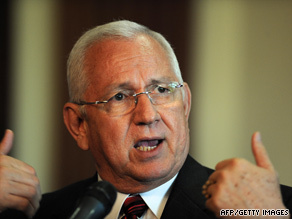 The owner of Canal 36, Esdras Amado Lopez, told CNN that 60 soldiers entered his station Monday morning to shut it down. They removed all of the equipment, he said. "They say that we offended the dignity of the president of Honduras, Roberto Micheletti," Lopez said, adding that he sees his station not as pro-Zelaya, but "pro-people." Honduran soldiers were stationed in front of the shuttered TV and radio stations and would not allow anyone to enter. The United Nations, the OAS and the European Union have condemned the coup and demanded that Zelaya be reinstated. Micheletti has vowed that Zelaya will never return to power and has said the deposed president will be arrested if he comes out of the Brazilian embassy in Tegucigalpa, the nation's capital. Micheletti has accused Zelaya of using the embassy to instigate an insurrection and this weekend gave the Brazilian embassy 10 days to decide the ousted president's status. Brazil rejected the Honduran ultimatum. On Monday night, Zelaya addressed the United Nations General Assembly via a mobile phone that his foreign minister held up at the podium. A "serious crime is taking place when the voice of the people is silenced and when the people who are being repressed are likewise silenced," Zelaya said. CNN's John Zarrella, Kim Segal and journalist Elvin Sandoval contributed to this report.